This past weekend, as I’ve mentioned, I headed down to Milwaukee with my son. The reason I went down there though was to get some new tattoos. My artist moved down there a couple years ago, and so the only time I can get art from him is when he’s doing a guest spot in town. I had originally intended to get a new tattoo when my artist was going to be at the Minneapolis Tattoo Convention. However, I got sick that week and decided that having the flu in a room full of people with open wounds wasn’t a great idea. So I decided that instead of waiting for him to come back, I would head down to where he is, as a fun weekend trip. My wife was out of town last weekend as well, for work, so it ended up being perfect timing. I decided that since I was traveling all that way that I should get two pieces instead of just one. We began the day with the first piece that I was intending to get at the convention, a nice Green Lantern symbol on my right, inner, forearm. It came out really good, and I loved that we decided to put a background on it. We debated it back and forth, but I’m liking where it turned out. The second piece I got was something I’ve been wanting for a long time, a tribute to Minnesota. My artist and I worked together on some ideas, and what he came up with was absolutely brilliant. It captures much of what makes Minnesota unique with it’s three distinct biomes. We’ve got a bison, and wind farm, in the southwest, all the way up to the lake in northeast. In between are different pine cones and leaves that make up the Minnesota landscape. The background is a rust red, to denote the mining industry that has shaped our state, especially in the northeast. I’m incredibly happy with how these turned out, and it has given me ideas for some other pieces in the future. My last tattoo was a celebration of my life of technology geekiness. I also wanted some ink that represents my love of beer. I worked with my artist to come up with something cool, and I couldn’t be happier with how it turned out. In particular the blue background looks amazing against the hops and barley. Last week I got a message from my tattoo artist that he was going to be in town for a few days, and wanted to see if there were any pieces I wanted to get done. I’ve got some ideas for larger works, but also some smaller ones. In particular I’ve been wanting to commemorate my history with technology with an image that reflects where I got my start. My very first computer was a Commodore 64 back in 1982. I was 8 years old, and it was the most amazing thing I owned. From that computer I learned how to program, and use an operating system, and how hardware worked. It was the start of a career that has now spanned close to two decades. To honor this, I decided I wanted an image of the CPU that powered the Commodore 64, the 6502 chip. This workhorse of a chip was an amazing piece of technology in it’s day. Systems such as the Apple IIe, Nintendo Famicom, Atari 2600 all used this chip (or variants), in addition to my beloved Commodore. It was truly a piece of my childhood in silicon form. My artist put together a nice rendition of the chip that wasn’t just a mechanical drawing of it, but was fun and stylized. I also asked that he make it look as if it was attached to my skin, and had him place the art on my back between my shoulder blades. In other words, it looks like I’m personally powered by the 6502. Additionally, I had him use the date of 1982 for the serial number on the chip, to designate when I got my C64. I’m very pleased with this idea and how it came out. This is a meaningful piece of my life, and this chip is responsible for the career I’ve at to this point. I felt like this was the best and more appropriate way to honor that history in tattoo form. Tonight I received my third tattoo, and my largest piece yet. The piece is the character Wan Shi Tong, from the show Avatar: The Last Airbender. I chose this character for a couple of different reasons. First, I am a big fan of the show, and loved the character of Wan Shi Tong. He was only in a few select episodes, but his personality was always interesting to me. He is the keeper of an ancient library, containing vast amounts of knowledge. His name in Chinese (萬事通) can be translated literally as “He who knows 10,000 things”. He is however, pained when people use that knowledge to harm others, and a focal point of his story is his desire to secure his knowledge so that no one can use it for evil ever again. The second reason for choosing this character, is because I wanted an image that honors my academic nature. I’ve always loved learning, and knowing as many things as possible. Hence my proclivity to collect academic degrees, even when I don’t need them. I wanted a depiction of that aspect of myself for this tattoo, and the character of Wan Shi Tong honors that. It also mixes with my geeky side, as not many people will probably know this character. This was a rather large piece, covering my entire upper arm, and containing a lot of details and shading. The image at the top is still very bright red from the process, and I’ll post a better one in a week or so, once the peeling and swelling has stopped. It took over 3.5 hours in the chair, but thankfully, my artist and I get along really well and have a lot in common to chat about (plus a girl scout showed up selling cookies, so I got a box of thin mints too!). I’m enjoying using my body as a canvas a little bit, now that I’m old enough to actually make thoughtful and informed choices about what to put on it. This might end up being the largest piece I ever get, but it probably won’t be the last. Today was inking day. 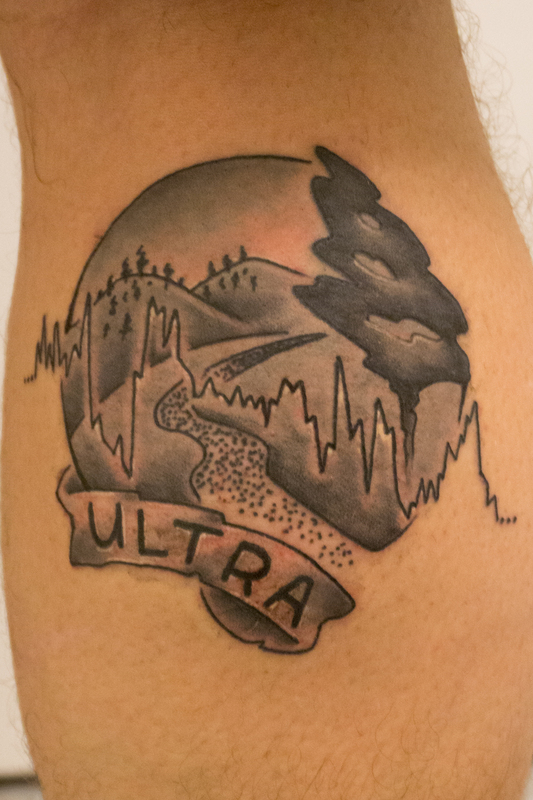 I decided I wanted to get a tattoo to commemorate my first ultramarathon, and after a couple weeks of working with my tattoo artist we came up with a design that I really love. So today I went into the shop for a couple hours and got it applied. My artist did an amazing job, and I’m REALLY happy with the outcome. 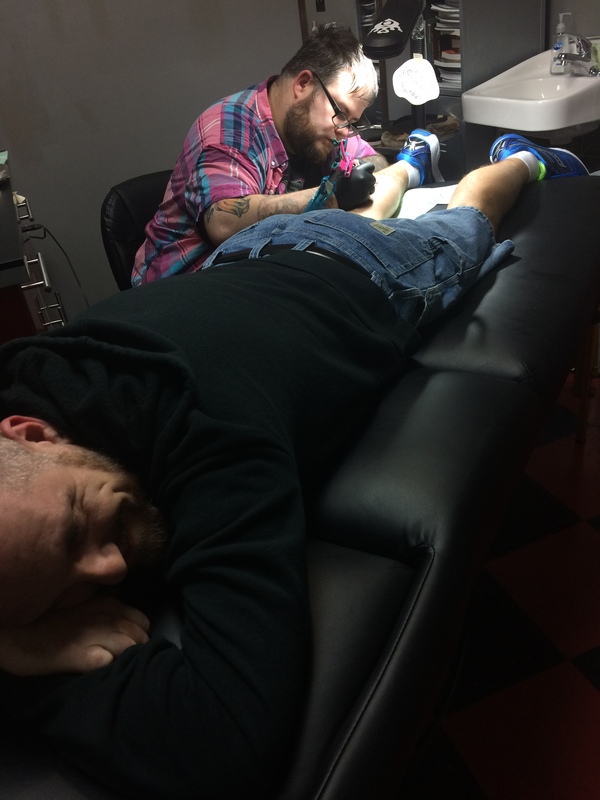 I’m very happy with the work of Jason at Queen of Hearts tattoo in Fridley. He was great to work with, and really came up with a winning piece of art.